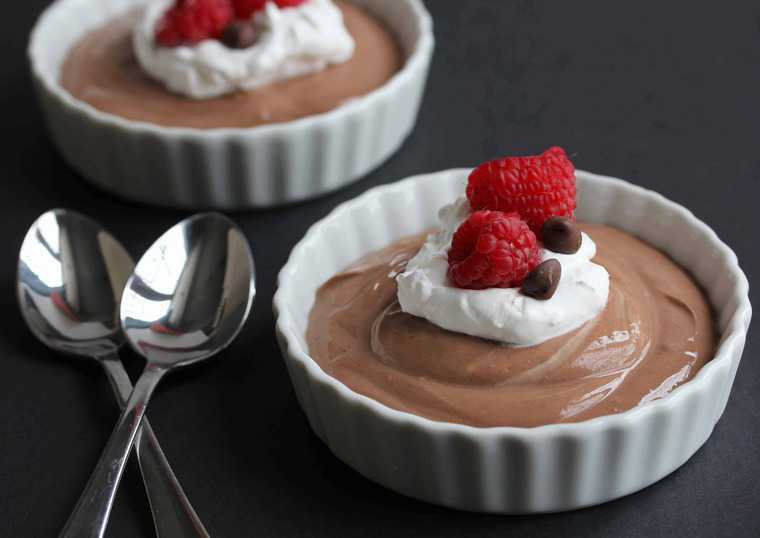 Here's a healthy version of everyone's favorite dessert: chocolate mousse. This recipe, substituting egg whites for whipped cream, will surprise you and your guests with a rich, decadent taste. Heat water in a pan over medium-low heat until just simmering. Combine 2 of the egg yolks with 2 tablespoons of the sugar, Chambord, milk, and salt in a heatproof bowl large enough to fit over the pan. Whisk the mixture constantly over the barely simmering water until the sugar dissolves. This take about 2 minutes. Remove from heat and stir in the melted chocolate. Beat 4 egg whites in a separate bowl on high speed until soft peaks form. Add 1 tablespoon sugar and the vanilla and continue beating the whites until the mixture holds staff, shiny peaks. Decorating the mousse with chocolate shavings, fresh raspberries and mint leaves makes a nice display.